asparagus | Cooking With Mr. C.
1. 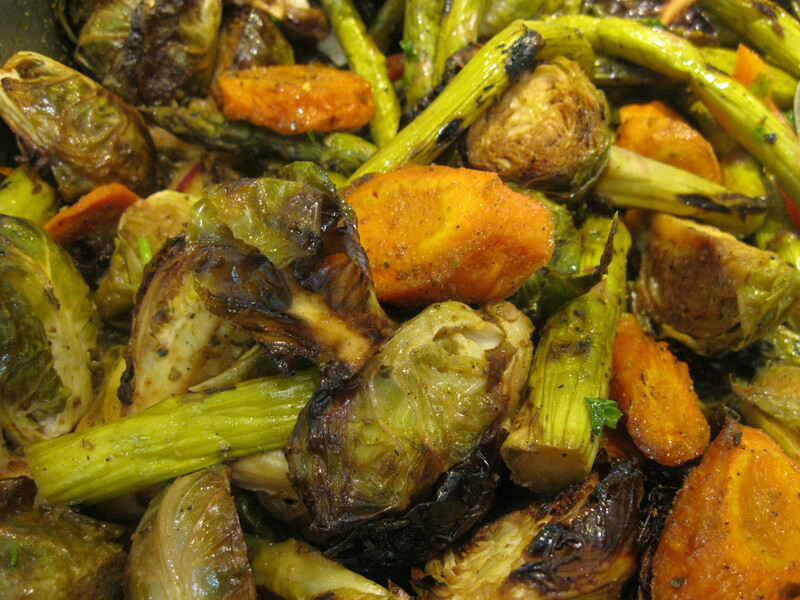 In a large baking pan, put all vegetables. Add olive oil and toss vegetables. Sprinkle with salt and pepper. 3. Place pan in oven and bake for about 40 minutes. Stir vegetables every 10 minutes. 4. Remove when vegetables are tender. In a large baking pan, coat the bottom with 1 1/2 tbsp. with olive oil. Layer asparagus and peppers in pan. Scatter garlic on top. Drizzle a little olive oil on top. Sprinkle with sea salt and black pepper. Stir vegetables around. Put back in the oven for another 10 minutes. *Vegetables should be tender when done. 1. In a large skillet put 2 tbs. of olive oil and half of the garlic. Sauté garlic for a minute. 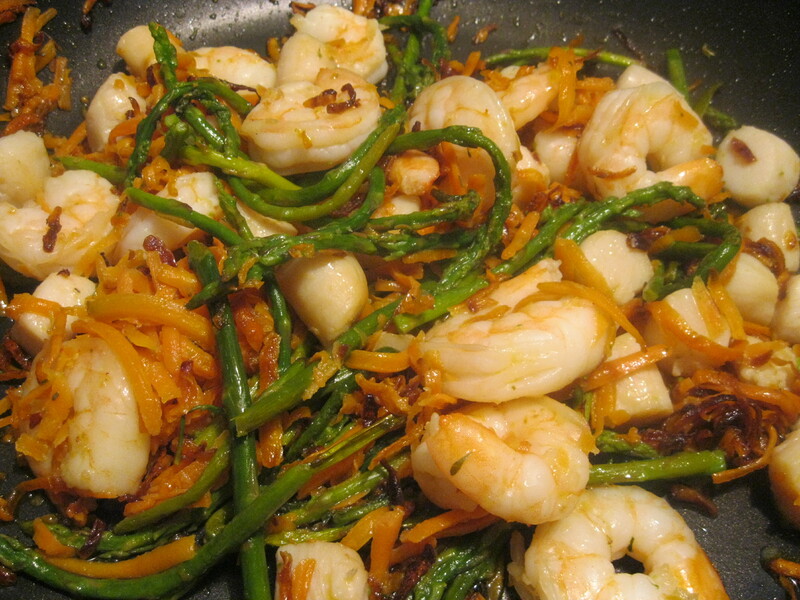 Add carrots and asparagus. Sprinkle with a pinch of sea salt and black pepper. Cook and stir until tender. (about 5 minutes) Turn off heat. 2. In a separate skillet, put 1 tbs. of olive oil and the rest of the garlic. Sauté for a minute and add shrimp and scallops. Stir and turn frequently. Cook for about 5 minutes. Once cooked, add to vegetables skillet. Raise heat, sprinkle a pinch of sea salt and stir. Serve hot. Serve as a meal or as mini appetizer or starter before a main course. See photo below. 1. In a large skillet, put 2 tbs. of olive oil. Add garlic and let brown. 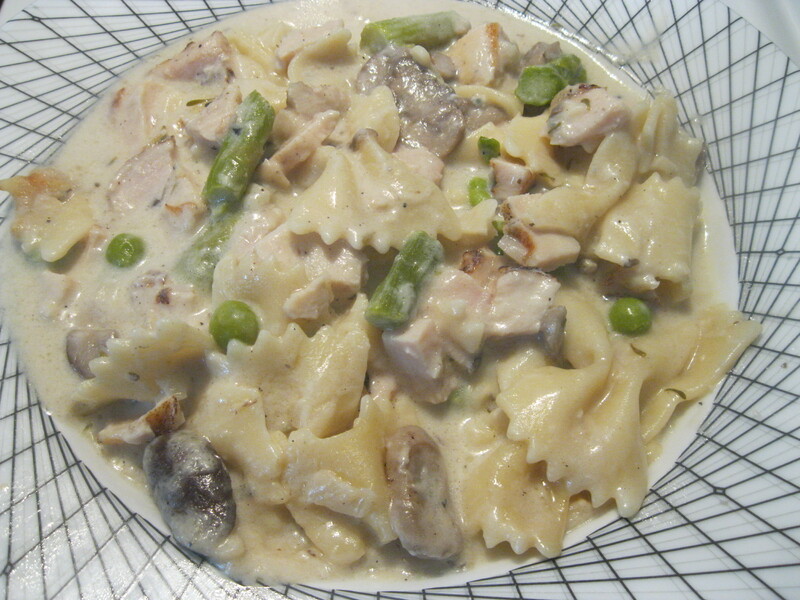 Add mushrooms and asparagus. Cook for about 5 minutes or until tender. Remove and put to the side. 2. Add an additional tbs. of olive oil. Cook chicken cutlets. Sprinkle with a pinch of sea salt and black pepper. 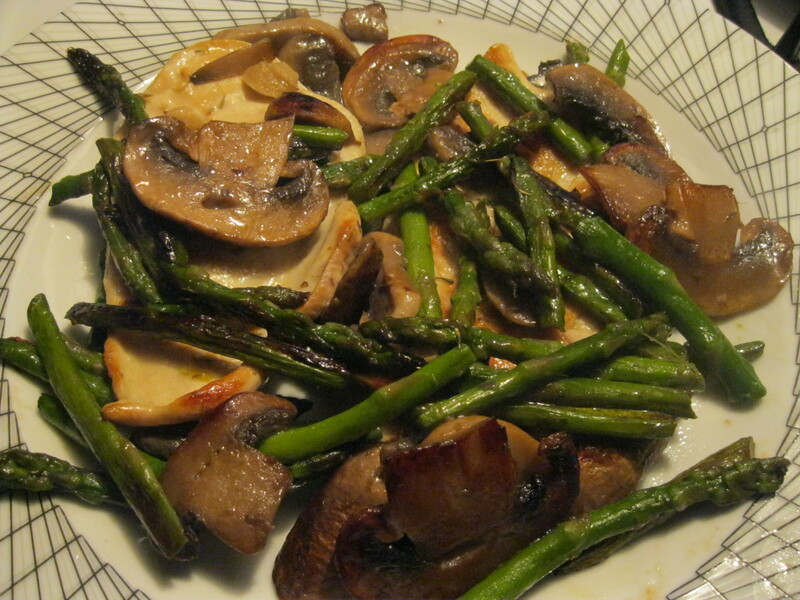 When cutlets are just about cooked, return mushrooms and asparagus and cook for an additional 2 minutes. 1. In a large skillet, put 2 tbsp. of olive oil. Cook cutlets on both sides. (3 min. per side) Make sure chicken is well cooked and put to the side. When cooled, cut into bite size pieces. 2. In the same skillet, add garlic and a tbsp. of olive oil. Brown garlic for a minute and then add mushrooms and asparagus. Cook for about 5 minutes. 3. Add peas, gorgonzola cheese, sea salt and black pepper. Cook for about 3-5 minutes. Cheese should become creamy. 4. Add cooked chicken pieces. Cook for an additional 2 minutes on a high heat. 5. Pour over pasta and serve. 1. 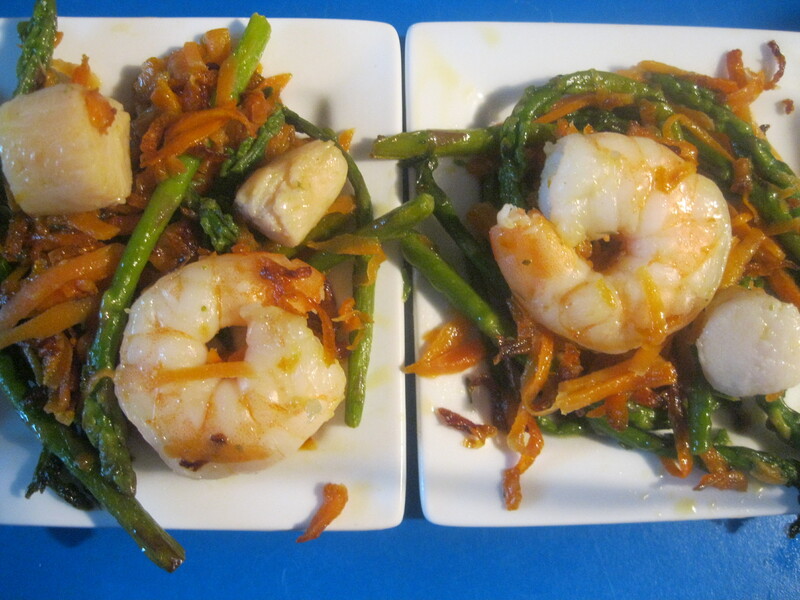 In a large bowl put asparagus and peeled butternut squash. Add 2 tbsp. of olive oil. Sprinkle with seas salt and parsley. Mix well. 2. Pour on to a baking pan. Drizzle a drop more olive oil on top. 4. 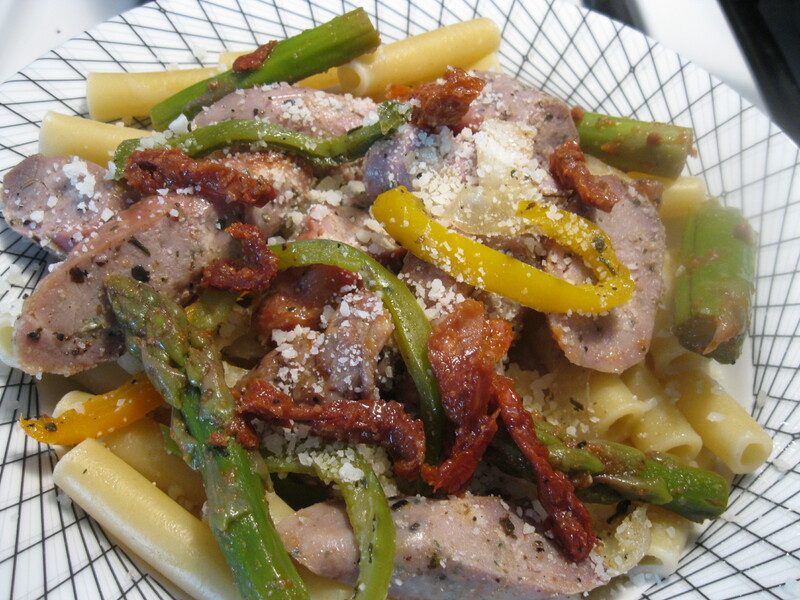 Cook pasta to desired taste. 5. In a large skillet, put 2 tbsp. of olive oil. Brown garlic for a minute. Add butternut squash and asparagus. Stir. Add another pinch of sea salt. 6. Drain pasta well. 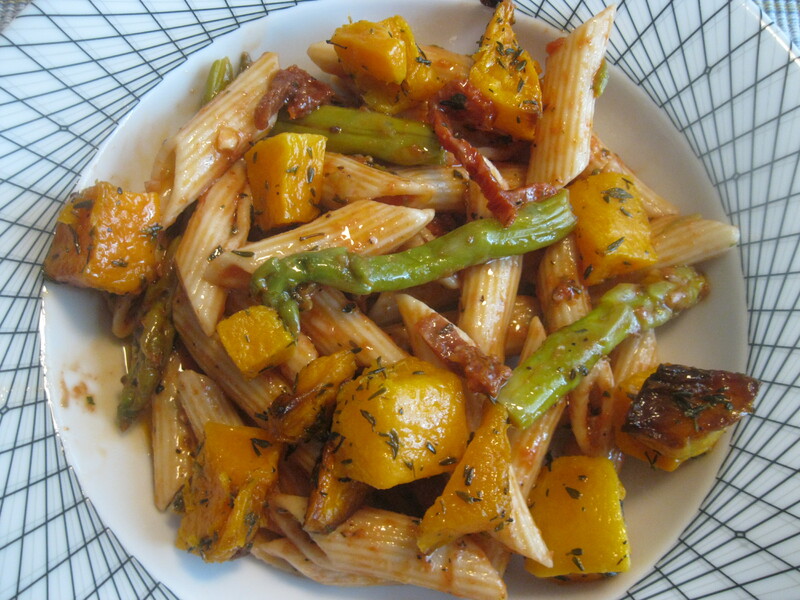 Pour butternut squash and asparagus on top. 1. Cook pasta to your desired taste and drain well. 2. In a large skillet put 2 tbs. olive oil. Cook sausage pieces for about 10 minutes. Remove and put to the side. 3. In the same pan, add another tbsp. of olive oil. 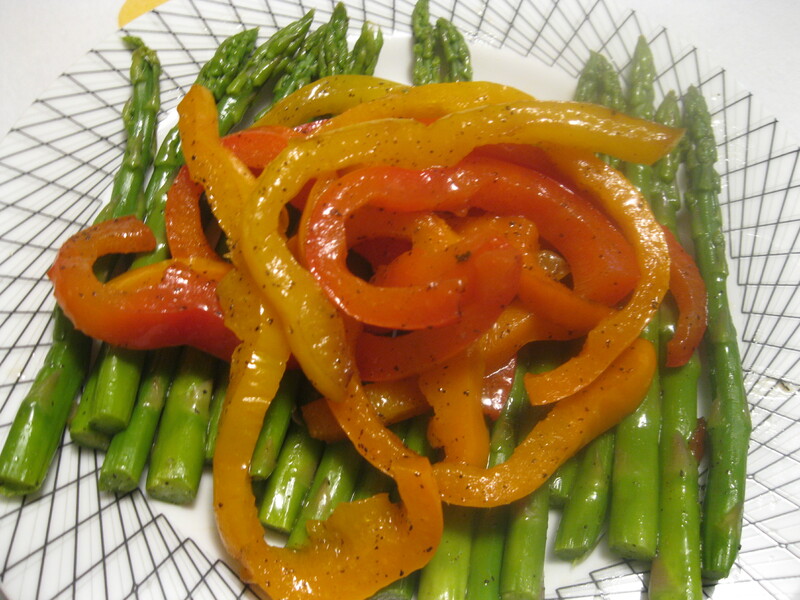 Cook peppers and asparagus. (about 5 minutes) Add a little extra olive oil if needed. 4. Sprinkle sea salt and pepper. Add cooked sausages and sun dried tomatoes to the pan. 5. Cook on a high heat (keep stirring) for 3 minutes and pour over pasta.